Sitting near Dempsey Hill's small fountain, in a typical black and white army barrack, Woody Antique House has all that you need to achieve your Asian-inspired furniture design or create the piece that will meet your own taste and style. Since 2000, Woody Antique House has been offering a wide and diverse range of Asian furniture and antiquities. Sourced from various areas in Asia such as China, Tibet, Mongolia, India, Myanmar, Thailand and Indonesia, the inventory includes a large selection of Chinese reproductions, Thai and Indonesian artefacts, and all types of resort-styled hyacinth furniture. For those with a discerning eye for vintage pieces, Woody Antique House also boasts some attractive antique furniture such as Mongolian and Tibetan sideboards and cabinets, Chinese cabinets, and Indian coffee tables, dining tables and cabinets, which are all meticulously restored to retain and reveal their original beauty. The stock here is immense and to ensure that there's always something new on offer, the furniture store receives its shipment on a monthly basis. Woody Antique House extends its offering through its sister store Woody Teak Collection boasting together an immense showroom space of over 7,000 square feet. 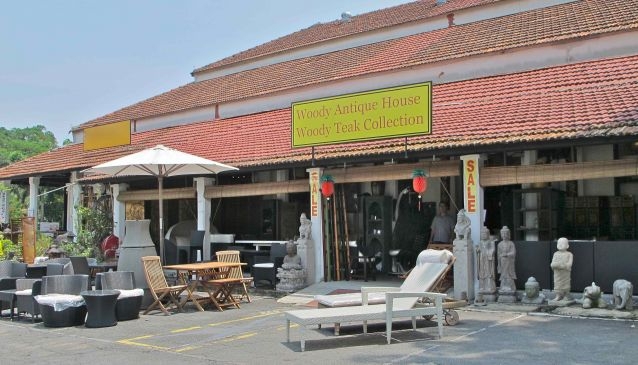 Located on the other side of the road with Chinese Warriors and other stone statues lined up at the entrance, Woody Teak Collection spans an extensive variety of stylish outdoor synthetic wicker, fine Burmese teakwood indoor and outdoor furniture and rustic recycled elm furniture. You'll appreciate the outdoor synthetic wicker furniture including sofa, armchairs, sun loungers and hanging chairs for their light tones, casual silhouettes and modern functionality, while the fine Burmese teakwood pieces such as daybeds, swing and dining sets will create a more exotic feel to your space. Woody Teak Collection also displays some rustic recycled elm furniture made from recycled rustic elm wood from old buildings. As a result, each piece comes with its own unique wood characteristics adding appeal and warmth to any interior. Beside its retail service, Woody Antique House is also the place to go if you're looking for custom made furniture in Singapore. The company customises furniture from recycled Elm wood and Teak wood according to customers' specifications, creating unique pieces and turning your furnishing dream into reality. At Woody Antique House, you'll be welcomed with a warm greeting from its friendly staff, who will be more than happy to assist you in finding this one special Asian piece of furniture you are looking for, or in creating the piece that will complement your home interior and reflect your taste in furniture design. - synthetic wicker range of outdoor furniture that look and feel like real rattan yet could be placed outdoors as the material is treated to withstand UV and rain.